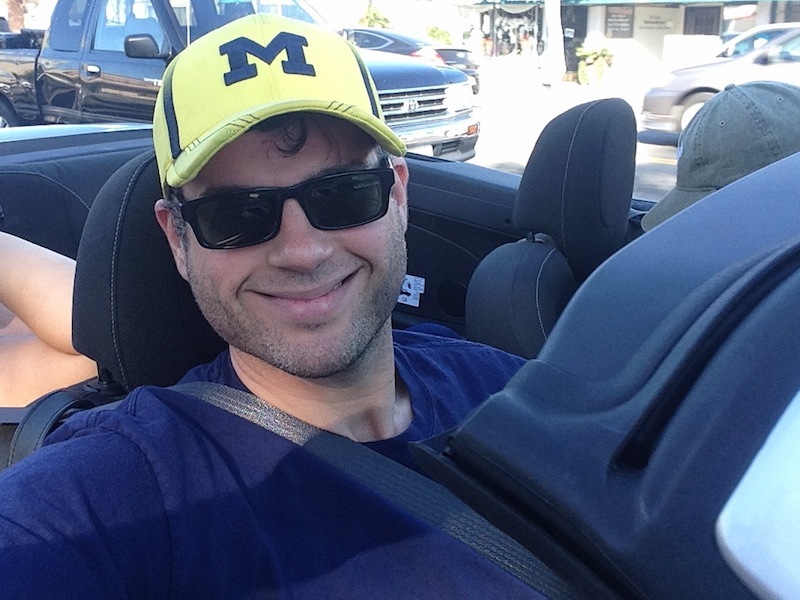 Three Restaurants, Two Days: Making Good Choices During a Weekend Filled With Eating Out | Keep It Up, David! Because we were busy and out of the house a lot, we ate out a few times – that sort of thing happens with houseguests. But I stayed good and made great choices each time! We met up with some of Chuck’s family at Hugo’s, one of my favorite restaurants, because it has a huge menu with lots of healthy choices, and they’re super accommodating for people with specific dietary needs (whether you’re a vegan, gluten-free, dairy-free, or just a conscious eater, like me). 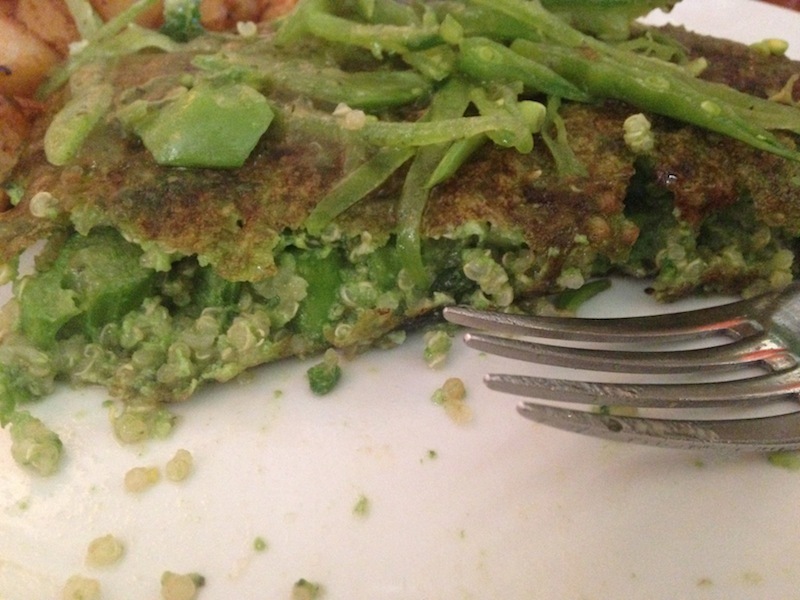 I ordered the Go Green Frittata, made with egg whites and a ton of vegetables, including spinach puree, which turned the whole thing green. On Friday, we went to a taping of “Real Time with Bill Maher,” which was very exciting. No photos to share, because electronics are confiscated at the studio, so we left our phones in the car. Fun fact: “Real Time” is taped on the exact same stage as “The Price Is Right”! That means every week, after “The Price Is Right” is done taping their episodes, their entire set is wheeled off, and Bill’s set moves in. They cover all the rainbow curtains with black curtains. Then, when Bill’s show is done, they turn it back! This happens every week. After the taping was over, we headed up the street to a restaurant and bar called Plan Check, which had all sorts of temptations. One menu item included ‘Pig Candy’ (which I’m guessing is some sort of candied bacon), and there were two fried chicken sandwiches that sounded mouth-watering. 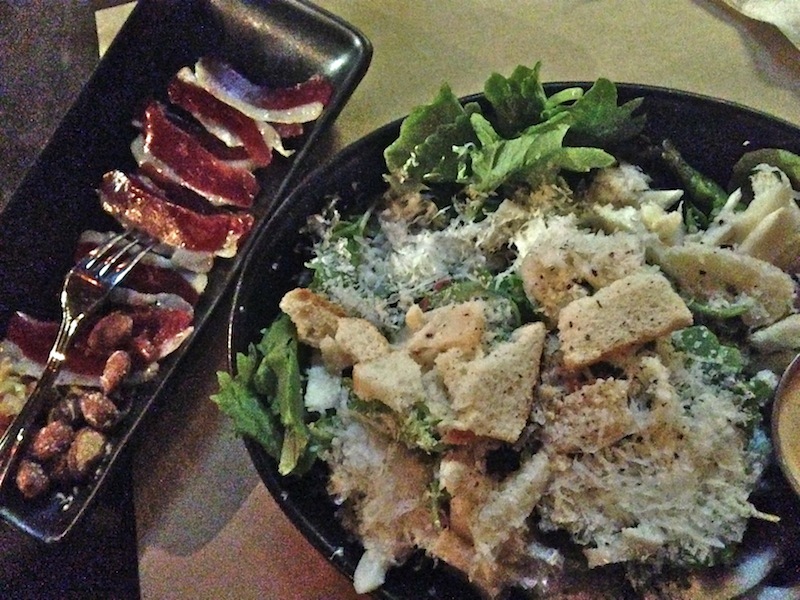 But I stuck to the kale caesar salad, with a side of cured duck breast ham, which seemed intriguing and was definitely delicious. The next day, we found ourselves in Santa Monica, wandering the 3rd Street Promenade, which is full of shopping and restaurants and closed to cars, and we ended up at an Italian place called Bravo. 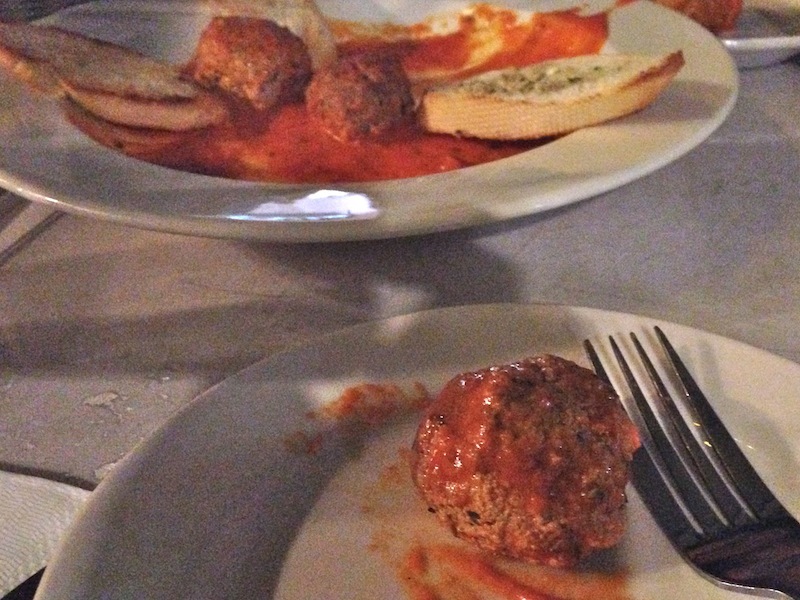 We split a meatball appetizer, so my meal started with two meatballs. 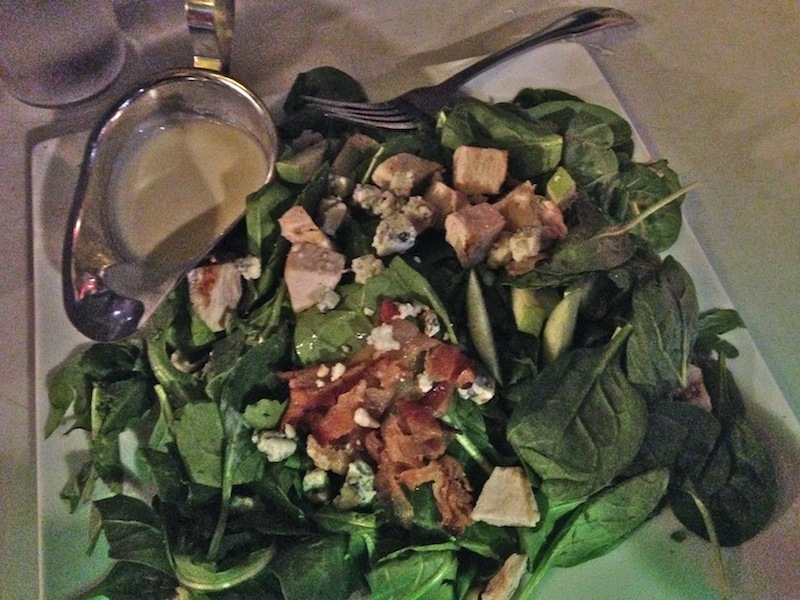 I got their Happy Cathy Salad, which had spinach, chicken, bacon, walnuts, and a few other things. To be honest, this meal was my least favorite. It wasn’t bad, it just didn’t excite me, and I bet there are plenty of other, better restaurants in Santa Monica. We did more than just eat, though. 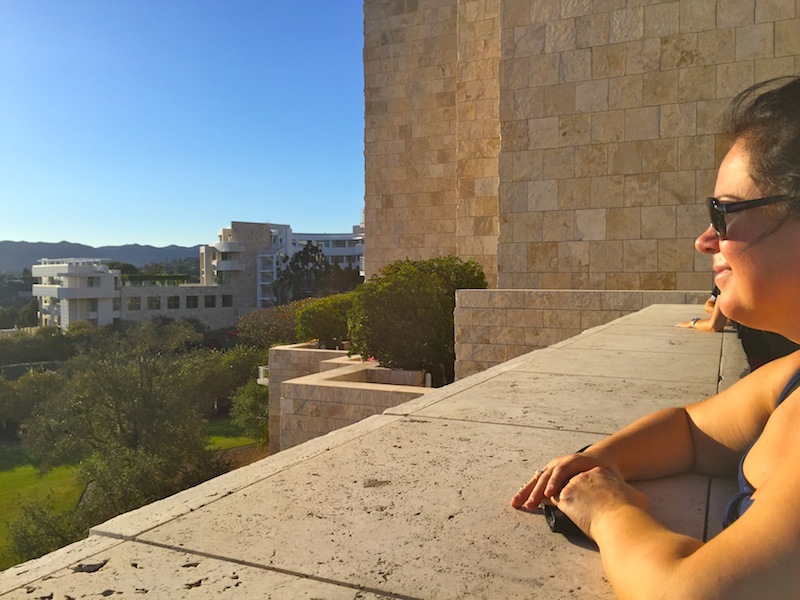 The other highlight was going to the Getty Center, a giant museum on top of a mountain. I’ve been five or six times (including a visit which resulted in some great before-and-after shots), and Laura’s been a few times, too, but it was Chuck’s first visit, and his son joined us as well. 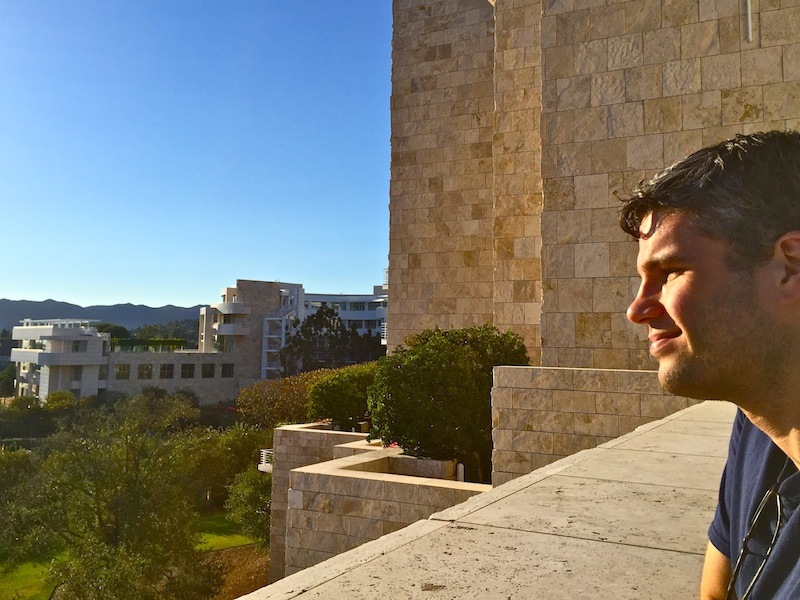 Getty Center has amazing views, and we were there at sunset, so it was especially spectacular. We could see the whole city. 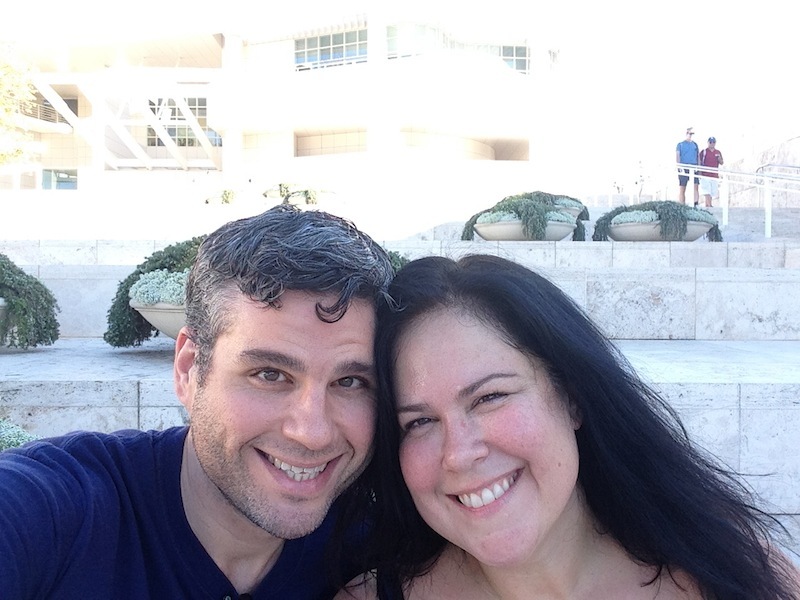 And here’s the both of us, on the front steps. 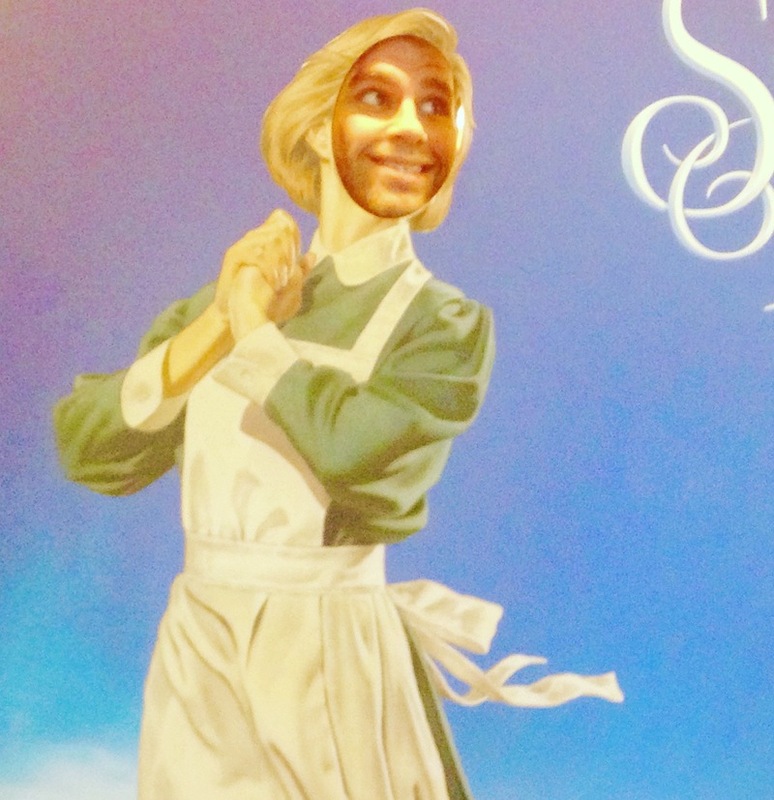 I also went with my aunt to see a new touring production of “The Sound of Music,” which was beautiful and stirring. They had a cut-out in the lobby, so anyone could be Maria, and I couldn’t resist! And because I hadn’t worked out that day, I went for a run when I got home, at 10:30pm. I did a 5k, and finished with some sets of sit-ups. The day before, I took Chuck to my gym, and we both had a nice workout – mine combined elliptical and weights. They day they arrived, I used my Bowflex MAX Trainer at home. Can’t skip my workouts even when family is in town! This entry was posted on Tuesday, October 13th, 2015 at 12:42 am and is filed under Uncategorized. You can follow any responses to this entry through the RSS 2.0 feed. You can leave a response, or trackback from your own site.